In the Heights: Man's Best Friend? We haven’t had a pet in years. Aside from a few betta fish (we’re on our third one now) the last legitimate house pet we had was our cat, Astro. I adopted Astro when we lived in Boston, about 13 years ago, and he was with us until the year after my oldest daughter was born. Since then, we’ve been hesitant to add another member to the family – between work and the kids and everything in between, I don’t think we have the time for it, and up until our recent move we just didn’t have the space. Now that we have a backyard and easy access to the street (our condo was on the third floor – another pet deterrent) my kids are begging for a dog, and while I do see one in our future (my husband and I both had dogs when we were kids and want to give our kids that experience as well) we want to get a bit more settled into the house before we add fur and drool and chew toys in the mix. The kids named this guy (or gal, not really sure) Sammy Super Spider. We found him/her hanging from the front of our house one evening, and s/he lived there for about a week, until s/he moved over to the side of the house. Every night at dusk s/he would build a beautiful and intricate web the size of a wok, and every morning s/he would take it down, crawl up to the eaves of the house, and wait out the sun. After much Internet research we decided s/he was an American House Spider, harmless to us, and let shim carry out his/her daily routine. The kids ran to check on it in the mornings before school and when they would get home. Catches its own food, cleans up its own house – the perfect pet! Sammy hasn’t been home for a few days now, but s/he seems to have been replaced by some new visitors. While at a neighborhood council meeting yesterday afternoon (the planning for our annual Halloween Haunt is underway!) I got a text from Leon that said “we have a huge problem.” Since he texted me this information, I knew that the problem couldn’t be that huge – a significant injury or natural disaster probably would have warranted an actual call, although the message did sound ominous. “What?” I responded. “Massive swarm of bees in the backyard,” he typed. WTF? Where did all these bees come from? 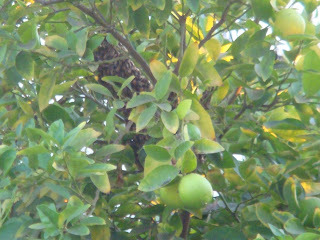 Were they making a nest in our lime tree? Were they planning to uproot the tree and fly off with it? Back to the Internet for more research. Turns out they are likely not here for good, and were probably just passing through on their way to their new nest. Apparently they swarm around the queen while scout bees seek out a suitable nesting site. Only rarely do they start building a comb on a tree limb, since they usually prefer more of a protected cavity. Although they aren’t as fun as Sammy Super Spider, since we can’t get close and watch them (in fact the kids aren’t allowed in the backyard until they’re gone) it’s so interesting to read about the queen and the drones and their instinctive behaviors. We’ve been checking in on them every few hours, hoping that they’re just passing through, but until then, I can’t go into the garage or take out the trash, which is especially upsetting considering the bags of recycling left over from our Sunday BBQ and cluttering up my back hallway.